Before Luke was born, we decided that using cloth diapers would be something we would be interested in trying. Yep, trying. I wanted to see what it was all about, see if it worked for us, and then invest in more diapers if we liked it. I liked the budget, environment, and bum-friendly appeal of using cloth. I'm definitely not opposed to using disposables (we are probably using them about 25% of the time right now), but trying out cloth was a doable + enticing option for us. I didn't spend hours upon hours researching. I haven't bought ten different brands to try out (which is not a bad idea, but I get overwhelmed with too many options!). Put it this way, I've kept it simple. After a bit of research (I tried not to get in over my head by spending years on research...because you could! 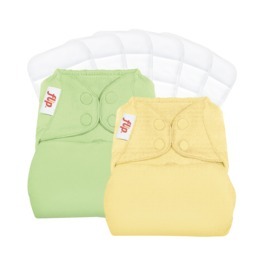 ), we decided on two brands: FLIP by Cottonbabies and Charlie Banana. FLIP is a hybrid diaper which just means that you put an insert into a shell and then snap it up. They have options for organic or regular inserts as well as disposable ones. Charlie Banana diapers are a one-size pocket hybrid diaper that needs to stuffed with an insert. They also have the option of buying disposable inserts for when you are on the go. I like that I can reuse the shell if it isn't dirty--this has helped reduce the amount of laundry that I'm doing. He hasn't had any leaks or blow-outs yet. They are a little bulky (but Luke is only 13 lbs, so that might change when he gets bigger). Sometimes I have trouble getting it all together quickly + efficiently. Especially since Luke is so little, I need to be able to change his diaper quickly (before he decides to do more business...) and the FLIP isn't super quick for me. You can't adjust the leg size, but for Luke, this hasn't been a problem yet. I like their fit. I think they look pretty trim for a cloth diaper. I like that I can adjust the leg size, and it was very easy to do. Once they are all put together, it's just like putting on a disposable with snaps (which are simple to do). I can do it quickly and easily. Luke hasn't had any leaks yet. Although it doesn't take much time, I do have to prep + stuff them all before using them. Taking out the insert isn't always pleasant. They do take a bit of time to dry. I'm still unsure of how they'll hold up after many, many washes and uses. We'll have to see! So what are my initial thoughts + reactions to using cloth so far? 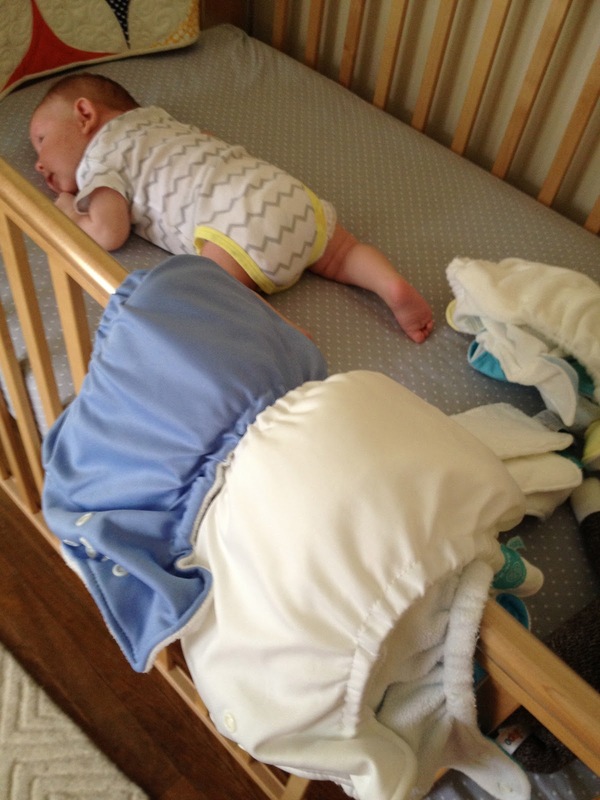 Have any of you experimented with cloth diapers? What brands do you like or use? I went with BumGenius All-In-One's, the Elemental and the ... Freetime, I think? I love them! I much prefer them to disposable. They've really gotten to just be part of what we do around here, and I'm really glad we went this route. I keep checking CottonBabies for their Seconds Sale, you can get them much cheaper! I want to give it a try too! I keep telling myself I will hold this one very loosely once the baby arrives. I'm torn in investing in it too much since I won't be staying home with our little one full time. Thanks for sharing your honest opinions so far! Congratulations on cloth nappying your baby. I did both of mine and am so pleased I did. I used Baby Beehinds, not sure if they are availble in the states but I still say well done, and also for getting the word out there about the great new world of Modern Cloth Nappies. Thanks for sharing! 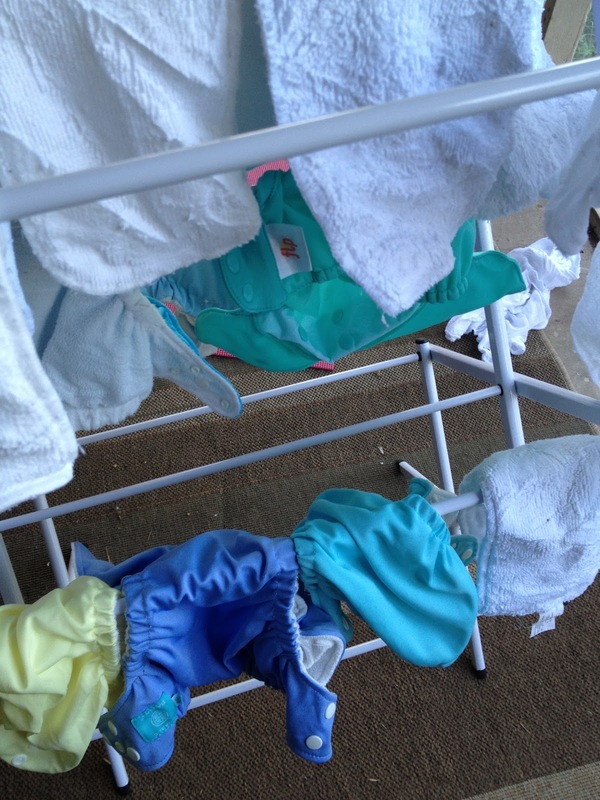 We'll be cloth diapering as well. Just making it through all of the size 1's I got that she barely fits in and then we're venturing into cloth land. I always love seeing what others use.